"New Book Reveals 48 Valuable Insights From Campaigns Reaching 250,000,000 Consumers in 30 Different Countries... and more importantly how you and your team can implement these insights to scale your Influencer Marketing in 2018!" 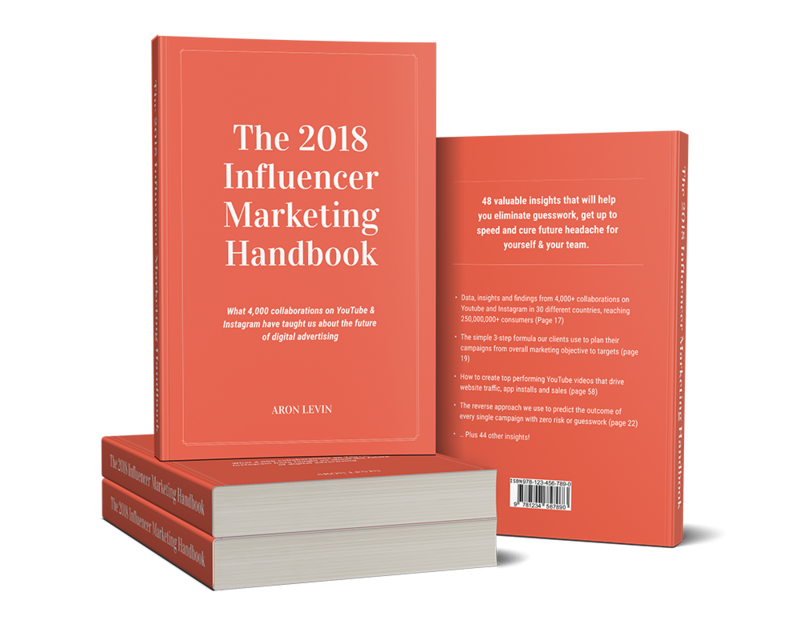 The 2018 Influencer Marketing Handbook is currently available on Amazon for $27.95 + Shipping. cover a small shipping fee. The 7 Principles of Word of Mouth and what Space X, Bitcoin, Uber and Amazon Prime have in common that can change the way you think about your communication strategy forever (Page 98). … Plus 44 other insights! Order the 2018 Influencer Marketing Handbook and take your Influencer Marketing to the next level. of the book or head over here to secure your copy. Teaming up with content creators from 30 different countries in 4,000+ collaborations reaching more than 250,000,000+ consumers online in the last two years, me and my team have invested our “Ten Thousand Hours Of Practice” (to quote Malcom Gladwell) into figuring out what works and what doesn’t if you’re looking to scale your influencer marketing with efficiency. This is what I do together with my team at Relatable. Every hour we’re awake, seven days per week. I’d like to share these insights with you, today. Tracking 13,000,000+ influencers on Instagram and 1.700.000+ YouTube channels in real-time we have also gathered a unique insight into the social media landscape of today. Insights that can help you accomplish better results if applied in the right way. …These golden nuggets can be helpful if you’re looking to scale your influencer marketing, connect the dots with your other marketing activities and free up time for you and your team. A few words of caution though. This isn’t for everyone. If you’re looking for a one-size-fits-all solution, an easy way out, advice that requires zero effort or a magic bullet – you’re likely in the wrong place. What I’m about to share with you are by no means a white paper with seven easy steps. I wish I could, but digital marketing in 2018 just ain't that simple. Instead, what I’d like to offer here is actionable hands-on advice that can be applied to your business if you agree that influencer marketing is important for your brand and are eager to create highly effective campaigns that drive real results. It should also be noted that this book is written with a very specific persona in mind. It’s by no means a blueprint or comprehensive guide covering each and every aspect of influencer marketing, but rather a collection of knowledge that can be extremely powerful if put into the hands of the right person. You’re already bought into the idea that influencer marketing can help the brand, product or services that you’re working for or with. There’s affinity for the brand, natural word of mouth for its services or an interesting story to tell that will resonate with the target segment. You want to scale your influencer marketing efforts but struggle with one or many of the aspects of this marketing channel. You’ve got some skin in the game and have tested things that are either working really well (and are looking to scale or make those things more efficient) or you’ve started out with influencer marketing but haven’t been able to see the results you’ve been hoping for! You sometimes feel overwhelmed by how fast things are moving in the digital advertising and social media landscape nowadays and want to get ahead and understand what rules to play by right now. On that note – If you’re reading this and it’s no longer 2018, head over to rlt.to/book to get the latest version! You value actionable pragmatic hands-on field-tested advice over academic theories. Now, if this feels anything like you, The 2018 Influencer Marketing Handbook will likely be a really good read. So a while back this year I decided to gather all those insights that we've applied to their marketing to quite frankly get it out of my hand and the very limited circle of people we've been able to meet with and talk to so far. Now, rather than holding back and protect what we've learned, I've decided to share it with the world – with you, your team and likely even our competitors. It's a collection of 48 valuable insights with data, expertise and advice that we've gathered over the last 2 years as we've built and launched some of the largest and most complex influencer marketing activations in the world, while helping many of our clients replace their existing media channel with this new and challenging form of advertising. But we've only printed 1,000 copies. Because we're giving them away for free. ...We'll actually end up loosing money on each book we give away. 1. We'll ship you a copy and you'll come back to us at some point later this year and become a client. 2. You'll find the content and insights in the book valuable enough to tell your friends or pass the copy along to someone else who'll become a client of ours. ... But, quite frankly, there's no way for us to know if either of that will happen or if it makes financial sense, so that's why we've only printed a limited batch. A bit of a gamble on our end, but that's life. Click the button below, fill out the order form to claim your copy and we’ll get it shipped to you as quick as possible. Only 1,000 copies available in this limited edition promotion.